Here’s my latest analysis in Berlin Policy Journal (German Council on Foreign Relations -DGAP).Pipe Dream? The Nord Stream 2 pipeline project is in danger of being derailed. A pipeline project to double Gazprom’s export capacity to Europe has always been controversial. A recent ruling by Poland’s competition authority could seriously undercut the support it has accrued, leaving its European backers at odds. The proposed Nord Stream 2 pipeline project has bitterly pitted European states that back the project, including Germany, the Netherlands, Austria, and France, against project opponents, including Ukraine, Poland, and other former Soviet-bloc states. The project aims to double the capacity of the existing huge, 55-billion-cubic-meter-per-year Nord Stream 1 pipeline, running in parallel to it under the Baltic Sea from near St. Petersburg in Russia directly to Greifswald in Germany. This dispute has exposed two very different views of Gazprom, Russia’s state-owned gas-export monopoly, and of Vladimir Putin’s Russia itself – one side sees it as a “necessary” and “reliable” energy supplier, the other a dangerous and manipulative adversary. This dispute is but one more collision inflicting lasting harm on the European Project. The latest row involves a ruling in late July by the Polish Office of Competition and Consumer Protection (Urzed Ochrony Konkurencji i Konsumentow, or UOKiK) rejecting an application by five private western European energy firms proposing to partner with Gazprom to build and operate Nord Stream 2. The firms are Germany’s E.ON (soon to be Uniper) and Wintershall, Austria’s OMV, Anglo-Dutch Shell, and France’s Engie. Shortly before the Polish announcement, the five companies agreed to withdraw their association proposal to avoid UOKiK initiating a legal process against them. The commission’s president, Marek Niechcial, declared categorically on August 12 that the Polish rejection was definitive, asserting “This will stop the [Nord Stream 2] deal.” The five firms have nevertheless made it clear they are seeking a strategy to work around the decision, and expect to proceed as planned. Gazprom has said the same. So why go through this proceeding in the first place? To understand these events better, I spoke with several experts and diplomats working on these matters in Moscow, Berlin, Washington, Paris, and Warsaw. An often-heard line of argument is that at least some of the five companies might actually have little commercial interest in the project, but need to preserve their relationships in Russia where they have large investments in energy projects. After all, the Kremlin has a track record of taking over projects from foreign partners with whom it has fallen out. A further theme in this vein is that Nord Stream 2 is not really needed in northwestern Europe, even though the Groningen field in the Netherlands and Norway’s reserves in the North Sea are declining, because future demand in northwestern Europe is overestimated and Liquefied Natural Gas (LNG) will be available from the United States. This view led to press speculation that the five firms likely welcomed the Polish decision, allowing them a graceful exit. However, virtually all the experts I spoke with had no doubt Nord Stream 2 would be a lucrative commercial enterprise over the long run, and that the five firms seem genuinely enthusiastic. Russian gas via pipeline is cheaper than other sources such as US LNG, and there will be a market as current sources decline. In any case, most of the analysts assert it should not be the EU’s concern if private firms insist on making what could be a bad commercial investment. All see the project continuing, albeit likely altered, with Gazprom expected to take delivery of the pipe shortly. But what then is the effect, if any, of the Polish decision? The main impact will be financial. The original plan called for each of the five firms to have a 10 percent stake, with Gazprom taking the remaining 50 percent. The five were to purchase stock in the enterprise covering 30 percent of the roughly $10 billion total cost. Gazprom would then contribute equity to cover about half the remaining 70 percent and seek financing for the remaining 35 percent or so. The investments by Gazprom, and especially by the heavy-hitting private western energy firms, were to put Gazprom in a good position to go to banks for the remaining financing. However, it appears the Polish decision has blocked these contributions. Unless a legal workaround can be found, Gazprom will now have to go to the bank for almost double the original amount (about 65 percent), and without its respectable partners, adding considerably to its financing costs. Complicating matters, Gazprom needs financing for other large projects too, including its hoped-for Turkish Stream and the costly Power of Siberia line to China; meanwhile, Gazprom and other Russian energy firms are under US, EU, and other sanctions related to Moscow’s Ukraine invasion and seizure of Crimea. The financial portion of the US and EU sanctions in particular block Gazprom from obtaining long-term credit from US or EU institutions – a major impediment. Experts stressed that if no workaround is found, the Polish decision will impose significant added costs and delays on Nord Stream 2. It remains to be seen if the five firms’ assertions that they are still on board is limited to purchasing and distributing the completed project’s gas. In Gazprom circles, many are confident that the company can employ enough lawyers and pull enough strings to circumvent such decisions, though the experts I spoke with scoffed at this assessment. The company also believes that the decision is a Polish play to force negotiations, which the country supposedly will use to demand a long-term gas discount and guarantees that Gazprom will continue using the Soviet-era Yamal pipeline that passes across Poland to deliver Russian gas to Germany for another 30 years. One can only say that we will soon see if the Polish decision was made with such intent, in spite of Polish assertions. Legally, the final decision will not be issued till the end of 2016. Most significantly, without the five private firms as co-builders and operators of the project, Nord Stream 2 becomes a sole Gazprom endeavor, and Gazprom loses crucial political cover. It was precisely concerns about Gazprom directly supplying too much of Europe’s gas already – it currently supplies about one-third – that led to energy-security and geopolitical concerns over Nord Stream 2. This risk is multiplied by the fact Gazprom is currently being charged by the European Commission with a long list of monopolist practices; that it has previously interrupted EU gas flows via Ukraine in 2006 and 2009 for political reasons; and that it is the state export monopoly of a country which recently invaded and annexed Ukrainian territory. Although the almost-universal retort in Berlin to such concerns is a dismissive “this is a purely commercial project” and “Gazprom has always been a reliable supplier” – and “they won’t dare” mess with Germany – the fact that 50 percent of Nord Stream 2 was to be controlled by major EU energy firms was key to undercutting arguments from Ukraine, Poland, and others. And political opposition has already been growing. 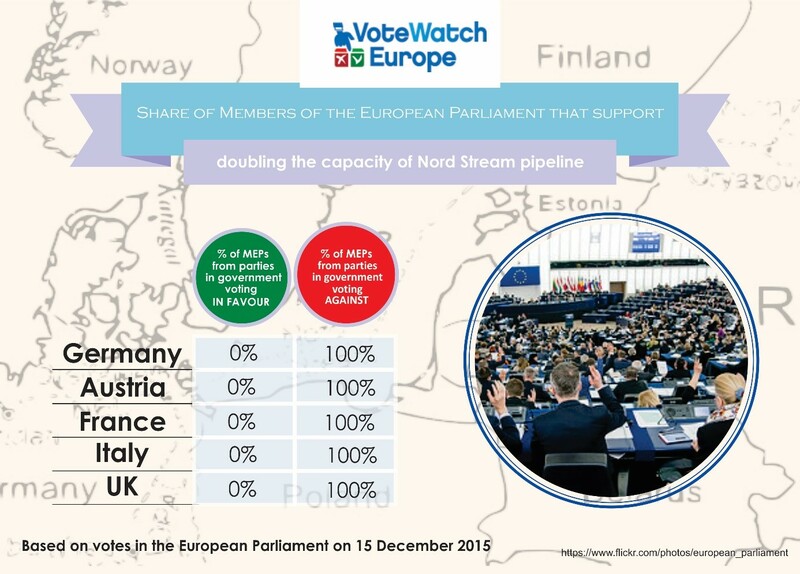 While complaints from the Visegrad Group, Ukraine, and other former-Soviet sphere states is not surprising, it is striking that, although the European Parliament has no legal say on the project, the delegations of four of the pro-Nord Stream 2 states in that body – Germany, Austria, France, and the United Kingdom (as well as Italy) – are on record as being unanimously opposed to the project. Whether the Polish decision was a politically independent one is, of course, an important issue. First, consider jurisdiction. Here, the Polish role is clear. Even though Nord Stream 2, like Nord Stream 1, would run under the Baltic Sea without crossing any other countries, including Poland, under Polish law firms doing business in Poland – which would include all five firms involved – that propose a new enterprise involving more than a certain euro-amount of business abroad (or somewhat less within Poland) must have the association approved by the national competition authority. This is something Nord Stream 2 backers could hardly raise an objection against as, under German law, a similar review is also required. After analyzing the material [UOKiK] issued objections to the concentration. The findings of the Office show that the concentration may lead to restrictions of competition. At the moment, Gazprom holds a dominant position in the supply of gas to the Polish and the transaction could lead to further strengthening the bargaining power the company could exert on customers in our country. However, was this decision independent from political influence? The ruling is clearly in line with the government’s anti-Nord Stream 2 positions, and the government has also moved decisively in recent weeks to diversify its oil imports away from predominantly Russian to Iranian imports. Experts point to the new PiS government’s track record of violating the independence of the country’s constitutional court and the civil service, and its suppression of critical journalists, as reasons to suspect a lack of autonomy from the competition authority. Indeed, the government’s track record caused Standard and Poor’s to downgrade the country in January, citing “weakening institutions”. Five months later Moody’s lowed it to A2, and was close last month to a further downgrade due to a “democratic deficit”. While this is disturbing, there are no specific accusations of irregularities about the Nord Stream 2 decision. However, the key problem the project is facing is political. Whether another Gazprom-dominated mega-project to send Russian gas to Europe for several decades is wise from the point of view of security-of-supply and geo-political risk is a legitimate and necessary issue for Brussels and member states to consider. And there is the legitimate question of whether one should commercially reward – and increase energy-dependence on – a state currently under international sanctions for the unlawful invasion and annexation of a neighbor’s territory. Nord Stream 2 is not merely a gas-supply contract, it is a large-volume and long-lasting energy infrastructure interconnection. This is the foundation of the strongest arguments against the project. Finally, there is one consideration given short shrift so far in Berlin. If Germany is serious about playing a role as leader of Europe, one would expect its government and elites to be willing to go the extra mile to win the confidence of those European partners expressing valid, historically rooted concerns about their national security vis-à-vis Russia. Berlin’s enthusiasm for this lucrative project, flying in the face of its partners’ geopolitical and energy-security concerns, is doing its much-valued soft-power profile great harm. This entry was posted in Energy and Geopolitics, Energy and Geostrategy, EU gas, Euroepen Union, France, Gazprom, Germany, Institutions and rule of law, international relations, Nord Stream, Poland, Resource conflicts, Russia, Trade and Commerce, Uncategorized and tagged Energy, energy union, EU gas, geopolitics, Germany, natural gas, Poland, Russia, Russian gas. Bookmark the permalink.